There are many ways to feed babies and many beliefs about which is the “right” way. For us, letting our son choose what and when to eat just made sense. Before I even heard the term “baby-led solids” (also known as baby-led weaning in many books and websites), I began to think about how I would feed my child. Before he was born, somehow I just knew I would not be giving him prepared baby food. While I don’t think there is anything inherently wrong with prepared baby food, it just didn’t fit with our family and our lifestyle. Baby-led solids clicked with us for several reasons. 1. We try to avoid processed foods. One of his first foods was cucumber sticks. Admittedly, we are sort of foodies in our house. We don’t have the budget to allow for fancy, gourmet meals very often, nor can we always afford to eat organically, but we do try. We cook with fresh ingredients and make dinner (and breakfast and lunch), as in, create a meal by putting ingredients together, almost every day. My husband and I don’t eat prepackaged, instant meals, so why would we feed those to our son? 2. Our son had always eaten whenever he wanted. Our son breastfed on cue (also known as “on demand”) his entire life. Baby-led solids allowed us to keep that lifestyle. When he was ready to eat, he’d eat. And when he was ready to stop, he stopped. We liked the respect that this afforded him and wanted to continue with that attitude when we introduced solid food. We’d put food on his tray and he’d eat it. Or not. But mostly he ate it. He was an eager eater from the beginning! 3. He was used to flavorful foods from my breastmilk. There was no need to give our son bland, flavorless food because he was used to a varied palate thanks to getting tastes of whatever I ate when he nursed. We were excited to let him keep tasting the flavors he was used to trying, just in a more immediate form. Another great first food is sweet potato fries. 4. It was cheap and easy. Baby-led solids added no extra cost to our budget (at first). Whatever we were eating, we’d just slide onto his tray and he’d indulge himself. We didn’t have to buy anything extra, nor did we have to pack anything extra when we traveled. It was so incredibly easy. I also really appreciated being able to just eat my food at mealtime without having to worry about feeding him. He fed himself from the very beginning. Baby-led solids was cheap, easy, and an effective way to continue on our journey of feeding our child with love and respect. It also afforded us a way to make sure we knew exactly what was going into our child’s body, since we were the ones to put the meals together, or the ones to hand him a fresh fruit or vegetable. And besides, it was a lot of fun watching him try new things and learn to feed himself! 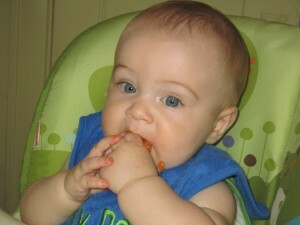 If you’re interested in learning more about baby-led solids, check out Gill Rapley’s book called Baby-led Weaning: Helping Your Baby to Love Good Food. It has so many great ideas and is full of information! There are some great resources available here on Natural Parents Network as well! Feeding baby led isn’t an all or nothing thin. I have puches of organic baby food for when we are on the go and I spoon feed her yogurt in the mornings. Just because you choose this style pfnweaning doesn’t mean you can’t ever give a puree. Sometimes shed want to eat faster than she could feed herself and we would help, not a problem. Now, I have a foodie who will eat anything and loves pickled and fermented foods as much as fruits. I hope that this groundwork we are laying carries her into childhood as a healthy eater. Such a great post. I think a lot of moms get afraid of giving babies solids. I was lucky in that we had a wonderful, seasoned pediatrician. When my first son was coming in as very underweight, he knew my commitment to breastfeeding and that we were feeding on demand. He also recognized that my son was developmentally on track (if not advanced), so he just suggested we start food (mashed banana and some boiled egg yolk). Many people couldn’t believe we were introducing food so early, but he absolutely loved the bananas and the experience of eating, continued to nurse well, and I was grateful to have not had to battle with the pediatrician since formula was not an option I was comfortable with. I wish more moms would see food as a suitable addition when needing to supplement their breastmilk. Thank you for reminding me of cucumber sticks! I have really let my diet go downhill, so I’ve been kind of freaking out as Spencer approaches the 6 month mark. Thankfully, I’m making improvements now – that will make it easier to offer him healthy choices. Cucumber sticks were one of Sasha’s favorites!